Entertainment Earth and Bif Bang Pow! 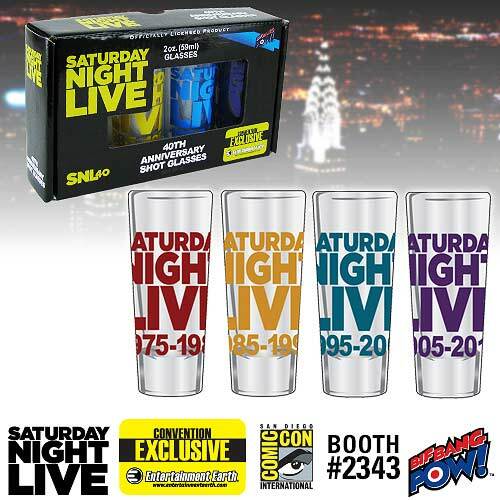 celebrate 40 years of Saturday Night Live with this set of 4 shot glasses, created just for SDCC. Each 2 oz. shot glass features 10 years of the show – 1975-1985, 1985-1995, 1995-2005 and 2005-2015 with a different color used for the text on each shot glass. These are priced at $17.99 and are available for pre-order now (assuming stock is available after the show). You can find them here. If you’re attending SDCC, you can find these and all the other Entertainment Earth SDCC exclusives at booth #2343.